US scientists have shed light on the mystery of why the males of some species of firefly flash in unison and in a pattern: it's to help females identify them as suitable mates. University of Connecticut professor of physiology and neurobiology Andrew Moiseff - who is not an entomologist but admits to being fascinated by fireflies since he was a student - teamed up with Georgia Southern University biology Professor Jonathan Copeland to study why some fireflies flash in synch. The results of their study, in which they flashed light-emitting diodes both in a pattern and randomly at female fireflies in a lab setting, suggest that synchronous flashing allows the female fireflies to recognise suitable mates. Prof. Moiseff and Copeland began studying fireflies from the Great Smoky Mountains National Park in Tennessee after a naturalist from the southern state told one of them that the fireflies at her summer cabin in the park flashed synchronously. Of the roughly 2,000 species of fireflies around the world, scientists estimate that only about one per cent synchronise their flashes. The result is thousands of male fireflies blinking at once over a large area to create a spectacular light show. The bioluminescent show put on by the males typically consists of one or more flashes followed by a pause, during which female fireflies, hopefully of the same species, will produce a single response flash, indicating to the males to "come hither" and multiply. "Females of certain species will respond to males of other species. "But their goal is to eat the male, not to mate," Prof. Moiseff said. Profs. Moiseff and Copeland hypothesised that the males' synchronised flash pattern helped females to recognise that they were dealing with the same species, and thus a suitable mate. 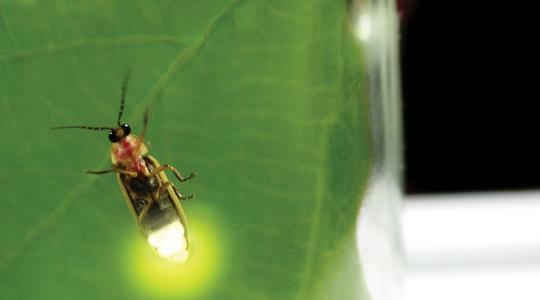 To test their theory, they collected females of the synchronous firefly species Photinus carolinus from the Smoky Mountains National Park and exposed them in the laboratory to groups of small blinking LED lights set up to mimic flashing male fireflies. The researchers varied the degree to which the flashes of the LEDs were in synch with one another, and found that the females responded to 82 per cent of synchronous flashes and as little as three percent of the random flashes. So Profs. Moiseff and Copeland concluded that fireflies that flash in synchrony are doing so to help preserve their species by helping females to recognise suitable mates. "The male flash pattern is important for indicating his species," Prof. Moiseff told AFP. "Females recognise that the males are the correct species and respond with their own species-specific flash. "Females may also be using flash information, such as flash intensity, to determine which male might be a better mate," he said.